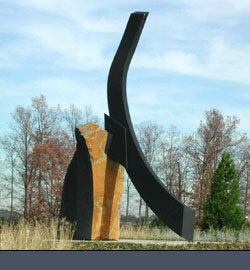 Installed at the entrance of the Dulles Trade Center, near Dulles Airport in the Washington DC area. Commissioned by Buchanan Partners, Inc. Washington, DC, it was designed to suggest and convey the soaring activities of the airport. Photos here were taken before final landscaping.